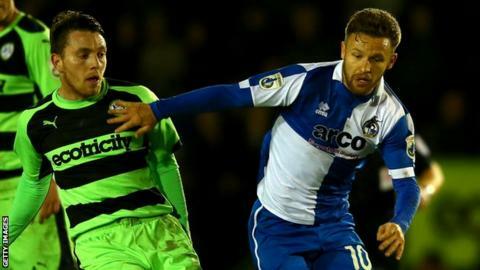 Bristol Rovers will take a narrow lead into the home leg of their Conference play-off semi-final despite ending with 10 men at Forest Green Rovers. Rovers clinched victory after Matty Taylor rounded home keeper Steve Arnold to convert against his former club from a tight angle. Away forward Ellis Harrison was dismissed with little under 15 minutes left for a second bookable offence. The hosts pressed for a leveller with Charlie Clough hitting the post. But the Pirates, who are aiming for an instant return to the Football League, held on to go into Sunday's return leg at the Memorial Ground with a slender advantage. "Before the game we wanted to still be in the tie and we definitely are, but we can't play like we did first half. "I think we just gave them too much respect - Steve Arnold kept us in the tie. "I said a lot of things at half time which I had to and I haven't said for a long time, but second half was much better. "We were in their faces more and worked harder, but we should be doing that from the start." "I thought in the first 45 minutes we were excellent. We were a little bit unfortunate not to score a few more goals. "We played some really good football and were on the front foot. "It's testament to my boys that, having missed out on the title on Saturday, there was no hangover, no disappointment and no players feeling sorry for themselves. "In the second half, as you'd expect, Forest Green came into it a bit more, though they only really started to ask questions of us when we went down to 10 men. But the boys saw it through." Match ends, Forest Green Rovers 0, Bristol Rovers 1. Second Half ends, Forest Green Rovers 0, Bristol Rovers 1. Chris Lines (Bristol Rovers) wins a free kick. Charlie Clough (Forest Green Rovers) hits the bar with a header from the centre of the box. Assisted by Rob Sinclair. Substitution, Forest Green Rovers. James Marwood replaces Elliott Frear. Attempt missed. Kurtis Guthrie (Forest Green Rovers) left footed shot from the centre of the box misses to the left. Assisted by James Norwood with a cross. Attempt missed. Aarran Racine (Forest Green Rovers) left footed shot from the centre of the box misses to the right. Attempt blocked. Dale Bennett (Forest Green Rovers) right footed shot from outside the box is blocked. Substitution, Bristol Rovers. Nathan Blissett replaces Jake Gosling. Attempt missed. Kurtis Guthrie (Forest Green Rovers) right footed shot from the centre of the box misses to the right. Second yellow card to Ellis Harrison (Bristol Rovers) for a bad foul. Steve Arnold (Forest Green Rovers) wins a free kick.